Work with your skills and personality. If you like the discipline and organization of planning everything in advance, make a list of potential Cupcake party guests and work through your plan to contact them all. If you’re a bit more fly-by-the-strings-of-your-apron, then take advantage of your bursts of energy to connect with your Cupcake Day party guests through social media or group emails! Giving makes people feel great and your supporters will get to enjoy a delicious cupcake. Think of all the people who you can promote your Cupcake party to, including people who may not live near you (you can send them a virtual cupcake by email!). Familiarize yourself with everything in your Personal Fundraising Centre and your Cupcake Host Kit (if you made a self-donation of $25 or more at registration). You can also download great promotional tools in the Resources and Downloads section of the website. Be sure to customize your Personal Fundraising Page with great stories and pictures showing off your passion for animals and share, share, share! Visit our Pinterest page for inspiration. Set an ambitious fundraising goal to measure your success by. Show your friends and family that you are committed to the cause by making the first donation to your cupcake campaign! Next, figure out how many cupcakes you want to bake and what you think the suggested donation amount should be from each Cupcake Day party guest to reach your goal. Suggest this donation amount and let them know how that amount will make a difference. Last year the average amount raised by each host was almost $300! 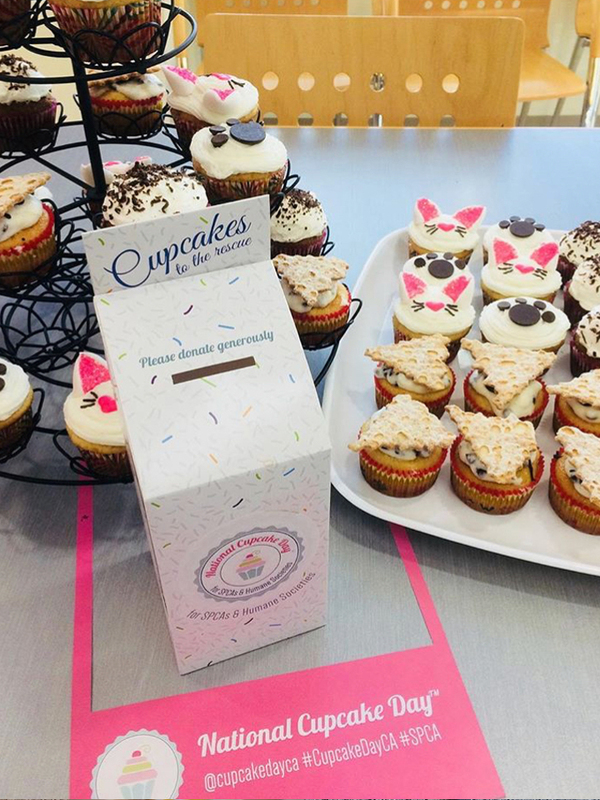 Tell your friends, co-workers and neighbours you are raising money for animals in need and invite them to your Cupcake Day party. Think of people who appreciate your baking. Think of people who love animals like you do! Ask them to donate online in advance so you can relax and enjoy your Cupcake Day party! Create a feeling of anticipation for your party guests. Send photos of your test batches and update your status when you find the perfect sprinkles. Be creative and have fun with how you stay connected! Cream butter or coconut oil and sugar (for approximately 5 minutes) until pale and fluffy. Remove cupcakes from pan immediately after baking and place on a wire rack for cooling. If you don’t have piping bags you can use Ziploc bags instead. Use scissors to snip off a small V-shape (to imitate a leaf tip), M-shape (to imitate a star tip) or a plain cut from the corner. A small spatula is a handy tool for spreading icing on cupcakes. If you can’t find one then a regular knife can be substituted. Thin chocolate wafer cookies make for great dog ears - they can be cut to shape with a serrated knife. Candy such as jelly beans, M&M’s, mini chocolate chips and marshmallows make great eyes and noses. Rolled fondant can be rolled thin and cut into shapes with small cookie cutters (e.g. dog bone, animal shapes). Let them dry overnight and place on your buttercream covered cupcake. For more inspiration on all things Cupcake visit our Pinterest Page. Want to have your Cupcake Day recipe featured here? Submit a winning recipe to info@nationalcupcakeday.ca to be featured!